Frequency meters measure repetitions per unit of time (frequency) and display it using a needle or graphic pointer. Industrial frequency meters are used in radio frequency (RF) and microwave applications to tune transmitters and otherwise display rapidly-changing frequencies; in audio applications to determine exact pitch; and in power applications to tune AC motors and other AC devices. Frequency meters can be classified by type. Two broad classes of meter include deflection meters and resonant reed meters. 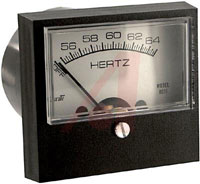 There are two basic types of deflection meters: moving-coil meters and ratio meters. Moving-coil meters are electrically resonant circuits that consist of two coils tuned to different frequencies and connected at right angles to one another. Frequencies in the middle of the range equalize the currents in the two coils and allow the needle or pointer to indicate the midpoint of the scale. Changes in frequency create an imbalance between these currents, causing the coils and the needle or pointer to move. Ratio meters use two frequency inputs: a known standard and an unknown amount. Resonant reed meters typically operate at lower frequencies and so are rarely used in RF applications. Their low frequencies, however, make them suitable for tuning motors and other devices which use applied AC power. Due to their simple, mechanical operation, resonant reed meters are less accurate than deflection types but are rugged enough to be used for field measurements. Reed meters simply consist of a series of metal reeds tuned to different frequencies. When AC power is applied to the meter, the reed closest in frequency to the signal will vibrate more than the others, causing an audible tone at that frequency. This is shown in the image below. Because the applied 120V AC power is properly tuned to 60 Hz, the 60 Hz center reed is shown vibrating more than the others. Important specifications for frequency meters include units of measure, frequency accuracy, and estimated weight. Battery- powered devices are suitable for field measurements. Temperature-compensated devices include programming or electrical components designed to counteract known errors caused by temperature changes. Frequency meters with mirrored scales improve readability by enabling users to avoid parallax errors. Devices with a range switch allow users to select the range of units to measure. Frequency meters with overload protection and diode testing are also available. Frequency meters are used in a variety of applications and industries, some of which are listed below.